Taverns of Time, the latest Hearthstone event, features the cutest member of the Bronze Dragonflight–Chromie! This special event, which runs from June 11th through July 3rd, adds unique arena-only cards, such as Chromie. Don’t forget to login on June 13th to get a free Golden Classic Pack that has all Golden cards in it! You might also want to take advantage of the “Get in Here” pack bundle that’s in the shop! Since we’re Wowhead, we wanted to highlight how some parts of this event are directly inspired by WoW! Chromie isn’t just a name from WoW slapped on a card. Chromie’s effect is to shuffle four historical epoch cards into your deck, which are not only interesting from a gameplay perspective, but also reference four important instances in the Caverns of Time. In WoW, this is home to Nozdormu and the Bronze Dragonflight, serving as a hub for many dungeons and raids taking players to WoW’s past. Our role as adventurers is to ensure these important moments in WoW’s history remain unchanged by the meddlesome Infinite Dragonflight. In this wing, a group of players must defend the last Guardian Medivh, in a swamp known as The Black Morass. The Guardian Medivh, possessed by Sargeras, attempts to open the Dark Portal to Draenor, while wave upon wave of dragonkin of the Infinite Dragonflight attempt to defeat Medivh in order to alter time and halt the invasion of Azeroth from Draenor. If you’re a Leatherworker, make sure you nab Pattern: Stylin’ Jungle Hat as a drop! Hyjal is the site of Nordrassil, the first World Tree. It’s brought back through the Caverns of Time so that players can relive the major event of Warcraft history, fighting with famous figures such as Jaina and Thrall. The battle of Mount Hyjal takes place at the denouement of Warcraft III: Reign of Chaos, the seventh chapter of the Night Elf campaign, Twilight of the Gods. Archimonde advances the mountain just as he will in the raid instance, along with his lieutenants, Kaz’rogal the Doom Lord, Azgalor the Pit Lord, Rage Winterchill the Lich, and Anetheron the Dreadlord. It’s still worth farming this instance for Tier 6, pets for Raiding with Leashes III: Drinkin’ From the Sunwell, and distinctive transmog like Cataclysm’s Edge and Apostle of Argus. The setting is seven years before TBC, to when the future Warchief Thrall was a slave of Aedelas Blackmoore, master of Durnholde Keep. The questing involves helping Thrall escape. The instance area in question spans from Southshore (where familiar personalities of WoW present can be found) to Tarren Mill. Before starting the combat quests in Old Hillsbrad, take a trip to Southshore. Here you will find many familiar faces looking much younger, including Kel’Thuzad, Sally Whitemane, Nat Pagle, Tirion Fordring, and Commander Mograine. (Read most of their dialogue here.) Thomas Yance also sells unique shirts for transmog. The instance is centered around helping Prince Arthas purge the city of Stratholme from the grain-infected populace. It is one of the first acts in Arthas’ descent into madness and evil. This instance was best known for the Reins of the Bronze Drake, a drop from the Infinite Corruptor. This is a heroic boss only visible if you complete the timed event in under 25 minutes, rewarding you with The Culling of Time. Roughly a year ago, the Chromie Scenario opened in Patch 7.2.5, sending players through multiple timeways to defeat Chromie’s attackers. As you gain reputation with Chromie by killing mobs in the scenario, you will unlock more powerful abilities for Chromie to help speed up your run and complete more timeways in one run. There are eight different timeways–four Dragonshrines and four Chronoportals, two of which are Hearthstone epochs. The other two, Well of Eternity and Andorhal, are also important places for the Bronze Dragonflight. Chromie also makes an appearance in Dragonflight in the fun Future You/Past You quest series. You can pick up Hourglass of Eternity during Wrath Timewalking to summon Future You! In Mystery of the Infinite, given by Chromie in Wrymrest Temple, you are sent to the Bronze Dragonshire to determine the leader of the Infinite Dragonflight. This dragonflight has created a time storm which prevents immortals such as Chromie from entering. Future You whispers: Hey there, <name>, don’t be alarmed. It’s me… you… from the future. I’m here to help. Future You whispers: Heads up… here they come. I’ll help as much as I can. Let’s just keep them off the hourglass! Future You whispers: No matter what, you can’t die, because would mean that I would cease to exist, right? But, I was here before when I was you. I’m so confused! Future You whispers: Wow, I’d forgotten how inexperienced I used to be. Future You whispers: I can’t believe that I used to wear that. Future You whispers: Listen. I’m not supposed to tell you this, but there’s going to be this party that you’re invited to. Whatever you do, DO NOT DRINK THE PUNCH! Future You whispers: Sorry, but Chromie said that I couldn’t reveal anything about your future to you. She said that if I did, I would cease to exist. Past you whispers: Whoa! You’re me, but from the future! Hey, my equipment got an upgrade. Cool! Past you whispers: Here come the Infinites! I’ve got to keep the hourglass safe. Can you help? Past you whispers: Chromie said that if I don’t do this just right, I might wink out of existence. If I go, then you go! Past you whispers: This equipment looks cool and all, but couldn’t we have done a little better? Are you even raiding? Past you whispers: Wait a minute! If you’re here, then that means that in the not-so-distant future I’m going to be you helping me? Are we stuck in a time loop? Past you whispers: I just want you to know that if we get through this alive, I’m making sure we turn out better than you. No offense. Past you whispers: I feel like I’m being pulled through time. Thanks for the help…. 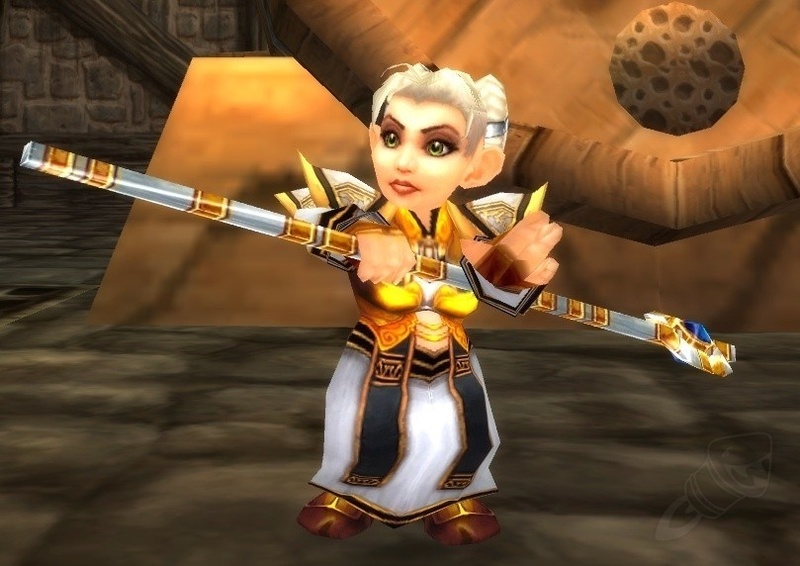 Also be sure to check out Chromie in Eastern Plaguelands for the touching The Battle of Darrowshire series–the present can’t be changed, but the past tragedies of Darrowshire can be softened. Oh, and if you want to find the original Taverns of Time? Look for Alexston Chrome inside the inn tucked away in the twisting passageways leading to the Caverns of Time.